1. Season chicken with salt and pepper, grill, bake or broil, cut into strips. Toasted Sesame & Ginger Asian Sauce. 3. 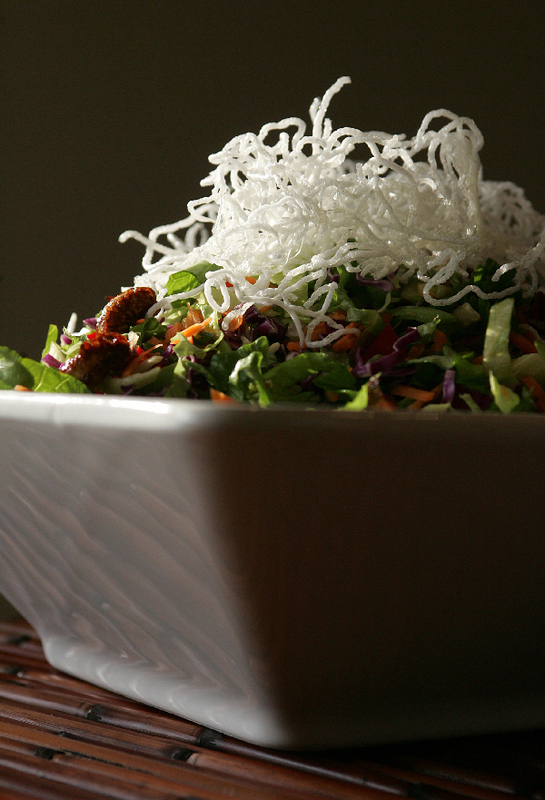 Top salad with grilled chicken and crunchy topping (see Chinese Chicken Salad Toppings). Makes two large or four small salads. Use your food processor to grate the carrots and the slicing blade to shred the cabbage. Allow enough time, this salad takes some preparation to chop all of the wonderful vegetables, but it’s worth it. The cashews are great on their own as a snack. 1. Place the oil in a med. sized skillet or wok on med high heat oil. 2. Carefully add the wonton strips or noodles to the hot oil. If using the noodles they may need to be broken apart. 3. Cook the noodles until puffed should only take seconds, turn over to puff other side. If the noodles start to brown, reduce heat. If using the wonton pieces cook until golden brown. 4. Carefully remove noodles or wontons from oil and place on paper towels. These are truly special, but take some extra work. 1. Combine bean sauce and brown sugar in a skillet or wok over med heat until the sugar dissolves. 2. Increase heat to med high, cook until it starts to thicken into a syrup. 3. Add the cashews and stir to coat. 4. Place the cashews on a parchment lined baking sheet. 5. Spread out on sheet (it’s a messy job). 6. Bake in 350 degree oven until bubbles appear. 7. Allow to cool slightly.